I have had Ash and Bones sitting waiting to be read for a while. The perfect opportunity came up to read it as part of the 144 books around the UK challenge and the fact that the second in the Detective MacReady series is due out over the summer. I thoroughly enjoyed it and can’t believe it took me so long to get around to reading it. Set in Cardiff, Ash and Bones follows trainee detective Will MacReady as he sets out on his new career path. He is introduced to his new team with a bang when a raid goes wrong and one of Cardiff’s oldest and most respected Detectives is killed on the job. Determined to bring the killer to justice, especially as it is one of their own that has been killed, it soon becomes apparent that there is more to this killing than first meets the eye. Ash and Bones is a no-holds barred, gritty and compelling read. Thomas’s experience of being a police officer comes through to give the novel a really authentic feel. There is no glitz and rose-tinted view about what it is like to be a detective, instead all of the difficulties and challenges that the police face are there, along with the mindset that comes following a number of years in the force and the sections of society you deal with on a day to day basis. I really got this and understood the frustrations after a number of years working within social services where you are governed and frustrated by red-tape and you spend the majority of your life dealing with the darker side of human nature. This worked brilliantly for me and really helped to draw me into the book as the experience felt real. There is quite a lot of police jargon, however this is easy to follow and adds to rather than detracts from the book. I really liked MacReady as a character and I liked the fact that he is a novice detective. All of the frustrations of not being considered able to carry out certain duties until he is fully trained, yet wanting to get stuck in and show initiative is there and I could relate to him. He has had a difficult upbringing and has his share of family troubles but he does not come across as a cliched. I look forward to following his career in the rest of the series. As I said the novel is set in Cardiff, however there is also an international edge with the book being punctuated by a story set between Nigeria and Portugal. This intrigued me from the outset and gave me another reason to keep on reading to find out how the storylines would connect. Thomas kept me on my toes throughout the book with an ending that I hadn’t figured out. A great start to a new detective series, Ash and Bones will appeal to those readers who like their crime novels to have a realistic edge and are not shy to walk on the seamier side of life in their reading. Gritty, dark and totally compelling, Ash and Bones is a cracking read. In a remote corner of Lagos in Nigeria, a stranger delivers a homeless boy to an orphanage, where the welcoming staff hide a terrible secret. At a squalid flat in the docks area of Cardiff, an early morning police raid goes catastrophically wrong. A plain clothes officer is shot dead at point blank range. The killer slips away. Ooh I was rather fond of this. It’s been waiting on the pile long enough that’ll teach me.. So gritty, intense, addictive crime fiction you are after is it? Well look no further, Mike Thomas has you covered. First in a new series featuring Will MacReady, Cardiff set, this is a crime drama with bite and some intensely compelling characters. Including Charlotte Beck – whose interaction and relationship with MacReady is one I want to see more of. ANYWAY lets talk nitty gritty. I did say it was gritty. Will as a character is totally awesome, new kid on the block but with his own way of thinking. The story is hard hitting and often unexpected, Will’s personal life is, well, I won’t say anything but intriguing and I also liked the way the dialogue popped off the page – overall it was very brilliant on very many levels. Great opening too – way to get the attention – and the plotting is clever and well flowing, never a dull moment. So Yes. I was really rather fond of this one. The next certainly won’t wait in line it’ll be straight to the top of the pile. A plain clothes officer is shot dead in a raid and the original suspect left in a coma. CID trainee Will MacReady is desperate to help, but ignored by his colleagues, follows his own leads that lead the detectives down a dark path. Mike Thomas brings the world of the police to authentic – and often – shocking life. His debut Pocket Notebook was better than good, telling the tale of a fireams officer going off the rails. The follow-up Ugly Bus was a minor classic, a foul-mouthed, warts and all story of the crew of a Territorial Support Group van, a compelling blend of darkness and humour reflecting the problems and pressures of front line policing – now picked up by the BBC who are turning it into a six-part serial. How often can an author come up with something as unique as those standalones? But this introduction to trainee Cardiff DC Will MacReady, the first in what promises to be a fascinating series, tops the lot. On his first day in the department a senior Detective Sergeant in shot dead in an early morning raid and the target, also shot, is left in a coma. With the city in shock and the police grimly determined to find the killer, Will is desperate to help. Largely ignored by his colleagues, who use him as a glorified tea-boy and gofer, he begins to investigate on his own and discovers a series of clues which lead the team down an increasingly dark path. But his discoveries come at a cost. His attitude first lands him in trouble, then an officer is seriously injured because of Will disobeying orders. While Thomas allows his protagonist some leeway, he is quick to stress real policing involves working as a team. I’m not going to say any more about the plot of the best crime/police thriller I have read for many years. It is a tribute to Thomas’ skills that it is not until well into the story that the pieces start to fall into place. It’s everything you want in a thriller. MacReady, despite his personal problems, is never a cliché, but it is the sheer authenticity of the characters, the setting, and the dialogue which makes this so special. The leanness of his writing keeps the story hurtling along, gradually pulling together two disparate plots. The format allows him a protagonist and a small support group of recognisable and well-drawn characters, all of whom can be allowed to develop in later episodes. The backgrounding is brilliant. Cardiff comes alive – surely some of the fringe characters, let alone the situations and settings are drawn direct from Thomas’ memory of his time on the street? But it is the changing face of police work and crime itself which makes this such a winner. His criminals are totally realistic, either drawn into their lifestyle through need or greed or the cold-eyed, vicious and heartless leaders of organised crime. As a crime reporter for many years and with friends of all operational ranks in The Job, I recognise every one of his coppers. The jaded cynicism of some contrasts with those trying to hold onto their humanity – such as Will and the talkative and determined lesbian Detective Sergeant Charlotte ‘Charlie’ Becks. Thomas pulls no punches. The problems, the shortcomings, the friction between the ‘Woolies’ and the ‘Colouring In Department’, united only by their contempt for the braided idiots of the PC dream factories that are force headquarters, where flow charts are created, buzzwords exchanged and endless meetings discuss vital matters as how to hold an efficient meeting, are presented as the awful facts they are. Some readers may need a police slang dictionary, but the acronyms and terminology add to the impact of this brilliantly observed, sharply written and superbly realistic story. Fans, myself included, will look forward to Thomas’ next instalment, but I suspect he may not be too popular at the Bridgend headquarters of Heddlu De Cymru! Ash and Bones introduces a rather young and lovely police officer, Will MacReady. This the world of Cardiff noir. It is the brand new novel from Mike Thomas. MacReady joins CID, on the day of the tragic death of a police officer. MacReady attempts to fit into the culture of CID as a trainee detective constable and learn the ropes, as well as navigate a shaky home life. It’s a complicated world, full of police jargon and pettiness. MacReady is definitely considered to be at the bottom of the pecking order. With dead coppers, child smuggling and a bleak setting, we follow the drama as it escalates. Cardiff is a place of fear. This is a very promising start to the series. I found myself rooting for MacReady and being charmed by him. He has grit and determination to seek the truth. I am intrigued to see where Thomas will take him next. There is a profound sense of realism and authenticity about Ash and Bones, which made it quite addictive. You can tell the author knows policing inside out. Definitely a series to keep an eye on. Thomas has a great character in Will MacReady, that has masses of potential. See for yourself! If you like your cop thrillers to come with a big dollop of authenticity, then step into the grim and gritty police world created by Mike Thomas. For more than two decades, Thomas was a police officer in the bustling city of Cardiff but he left the force last year to write full time and this new voice in crime fiction is already hitting the big time. His second novel, Ugly Bus, is currently in development for a six-part television series with the BBC and Ash and Bones, the first of what promises to be an exciting new series starring a rookie CID officer operating in the shadowy underbelly of Cardiff, is a stunning opener. In a remote corner of Lagos in Nigeria, a stranger sets off from a sprawling shanty town in a battered taxi to deliver a homeless, whimpering boy to an orphanage where the welcoming staff hide a terrible secret. Thousands of miles away, at a squalid flat in the moss-swamped alleyways of drab maisonettes near the Cardiff docks, an early morning CID raid goes catastrophically wrong when the police are not the only unexpected guests. Within seconds, a high-flying plain clothes officer, DS Bob Garratt, is shot dead at point blank range and the suspect they had been tracking is left in a coma. The killer, whose identity is unknown, slips away. Young and inexperienced, Will MacReady has just started his first day with the CID and the shooting plunges him in at the deep end. With the city in a state of shock and the entire force reeling, he is desperate to help but is soon out of his depth as passions run high and the team is led down an increasingly dark path. When another body is found in the harbour, after almost ritualistic mutilation, MacReady quickly realises that this job will be harder than he had ever dreamed and that his colleagues will need his input more than he had ever imagined. Thomas packs this edgy thriller with fast-paced action sequences, believable characters and some tasty plot twists but it is the breathtakingly real police procedural, slick dialogue and taut, stripped-to-the-bone writing that grabs the reader and won’t let go. Joining freshman Will MacReady and the doggedly cynical, tough-as-old-boots CID team at Cardiff central is about as near as crime fans will get to tagging along with a real murder squad and Thomas’ ability to sum a scene or a character in the least number of words only adds to the brisk, brusque tone of this lean but seductive thriller. Mike Thomas, a former Cardiff police officer turned author, first came to my attention with his novel A Pocket Notebook, a dark, funny tale of a firearms officer going off the rails. Next up was his hugely enjoyable Ugly Bus, literally one of the best books I have read, and one of the few to feature as its protagonists’ members of the TSG. The Territorial Support Group is the nearest UK police forces come to having a riot squad, and as such when it does appear in fiction it’s usually as knuckle dragging simpletons. Both of these books are well worth a read, Ugly Bus in particular deserving a recommendation. It is with more than a little excitement that I heard recently that Ugly Bus has been picked up by the BBC for dramatisation and I for one will be glued to my TV when it airs. But what do after penning two original tales? How often can one come up with something unique? For his third book, Mike Thomas has chosen to tread the safer ground of the police procedural. This choice is understandable as it allows him to develop a small group of characters, the protagonist and a support cast if you will, and flesh them out over a series of novels. It also allows him to tell a more traditional crime story than he has so far. Of course this is not without risk. Until now Thomas’s has been an original voice, one that stood out from the mass of other crime writers with their serried ranks of police detectives and serial killers. Might he sink into cliché and pastiche? Luckily for his fans Thomas delivers. Ash and Bones is a superior police procedural to much of the opposition. Quite simply it’s a better story. First let’s look at the plot. A squad of police raid a flat looking for low-level criminal. Unfortunately, someone else is there and one of their number is gunned down and killed. The occupant of the flat, the criminal they were after, is also shot and ends up in a coma. Enter DC Will McReady and his colleagues in the CID. It’s Will’s first day and he’s frustrated to have a bit part in the murder investigation, shunted onto other cases with a colleague, Sergeant Charlie Becks. Of course Will, who has various problems at home, isn’t willing to take this and is determined to insert himself into the centre of the action. This might sound predictable, the cop with the dysfunctional personal life playing maverick, but Thomas is too smart a writer to play that trick. While it’s true that Will manages to bend the rules and uncover leads that others have risked it’s not without cost. There are consequences to his lone ranger antics and his superiors first bollock him and later punish him for doing so. Also his actions have real negative effects and at one point an officer alongside him gets seriously hurt in direct consequence of him disobeying orders. Real police work is teamwork and while the author gives his protagonist leeway to pull the narrative along, this is never forgotten in this tale. The other thing I liked is he avoids what I consider the lazy device of the serial killer. In my opinion far too many crime writers have a serial killer in their novels. And not just a serial killer, one who kills in outlandish and byzantine ways. As well as being cheesy and completely unrealistic, I’ve always found these tales – the writers of whom seem to enjoy just a little too much penning scenes of young women being tortured and abused – sensationalist and salacious. Thomas forges a different path. His tale revolves around some nasty criminals but they’re not the lazy creations of most writers. And while there is violence in this book, descriptions of bodies which have been tortured and butchered, it’s never titillating. In fact, the author has managed that rare beast: a crime novel that is both hugely enjoyable whilst also trying to say something. The reader feels like they get an insight into the coal face of policing in modern British city, the nature of organised crime, the jaded cynicism of some police officers whilst others (in this case Will and Sergeant Becks) try to keep hold of their humanity. In conclusion this is a really good read and an impressive start to a new series. On Amazon it’s listed as Ash & Bones (Will McReady 1) so I guess we will revisit Will and Co in the future. I hope it’s soon and I will be reading. At a squalid flat near the Cardiff docks, an early morning police raid goes catastrophically wrong. The police are not the only unexpected guests. In the aftermath, a policeman is shot dead and the suspect is left in a coma. The killer, identity unknown, slips away. the estate was washed in muted orange: a hive of concrete walkways and dank, moss-swamped alleys, of drab maisonettes, of council money pissed away on regeneration after regeneration for people who, as far as he was concerned, deserved none of it.” Behind the glassy flanks of Loudoun house you can see the Millenium Stadium’s spires scraping the sky. Finally back home to the Cardiff Bay police station – with it’s faceless, anonymous corridors. Ah well, there’s stuff that goes on here that would frighten the ash and bones of you…. This one had more grit in it than a sandwich eaten on a windy day in Cardiff Bay. A solid police procedural with links to Lagos which really interested me. The author has been a police officer in the very city he writes about and you can tell. He’s walked each and every beat of the police in the novel for the authenticity really stands out. Gets really dark this one – no spoilers here but in the early pages a police officer gets shot at point blank range and that’s not the worst of it. Going to get the rest in the series as I like this new addition to the Welsh literary landscape! 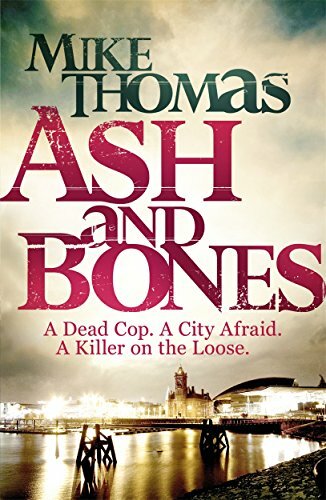 For those, like me, who love British police procedurals, delve into the super Welsh mystery ASH AND BONES, and view Cardiff as you’ve not seen it [it sure wasn’t like this in “Torchwood” ]. Newly-minted Detective Constable Will MacReady is ready, willing, and eager to detect. The problem, in his colleague’s view, is Will’ s independent streak. Like Robert Bryndza’ s series protagonist DCI Erika Foster, Will goes where the clues lead–minus backup and without hierarchical permission. Reviewed on 15th May 2016 by Mallory Heart.